HotHardware got one of those brand new HP Envy x360 15z laptops with the AMD Ryzen 5 2500U processor. The site did a number of benchmarks to figure out if the processor's integrated Vega 8 GPU is capable of delivering good gaming performance. As you may know, the Ryzen 5 2500U has 8 Vega CUs with a frequency of up to 1100MHz. The Ryzen 7 2700U packs the faster Vega 10 with 10 CUs, but so far the Ryzen 5 2500U is the only Ryzen APU that has made it to the market. In terms of gaming performance, this APU is a big step up versus systems that feature 8th Gen Core processors with Intel's UHD 620 integrated graphics. The Vega 8 IGP is 60-70 percent faster in some tests and makes older gaming titles playable at a Full HD resolution. Playable framerates in new games like Middle Earth: Shadow of War can only be achieved by turning image quality to medium or even low. The site also found that the Vega 8 IGP is not able to match the performance of the GeForce MX150, which is one of NVIDIA's entry-level discrete GPUs. 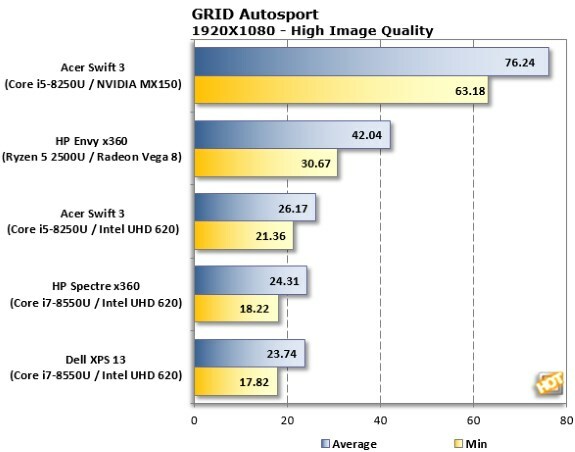 Perhaps the Vega 10 IGP will get a bit closer. Overall, HotHardware says the HP Envy x360 15z with the AMD Ryzen 5 2500U delivers great performance at a low $729 price (deals make it even cheaper), but the site complains the device has a very low battery life. Word is also going around that this laptop supports FreeSync.